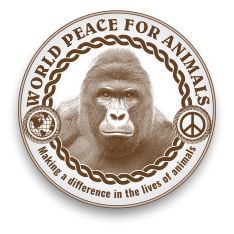 The theme of this "World Peace For Animals" project is to revisit the biblical word DOMINION: a word truly misunderstood! The animals desperately need us to help end their persecution and allow them to live in peace, the way they were created to live. Humans must serve them and honor their Spirit. Eyes are the mirrors and windows of the Soul. This is how we will find the true reflection of ourselves. Divinity is within you, as it with all! This project is devoted to serving animals in its myriad forms through all life's challenges! We endeavor to open up the hearts of humans to feel what their eyes refuse to see through transcending lyrics. Our songs release a deeply emotive prayer-like message so humans will honor their Spirit-Soul. "There is no separateness...we are the Oneness of the One," is a lyric in one of our fabulously heart-felt songs! Living love is the essence of life, and making a difference in the lives of animals through music is the path of heart! Animals come to Earth to be our teachers; they offer us the way to Truth! In many of our songs, the word KARMA is mentioned: whether we serve or not, the animals are referred to as KARMA! In the word SERVE is the word SEE. If we do not SEE through to their SOUL, this is where KARMIC LAW comes into play! Honoring animals is honoring our HIGHER-SELF, the I AM GOD. To serve is to see GOD within each, including the animals, and to see beyond appearance to the I AM. This is essence of unconditional love. Our service is to see the I AM in each. This is the truth of our Divinity. Prayers for love and healing in the Light of God for the Universe!